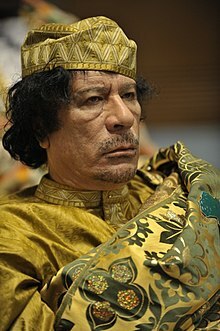 Muammar Muhammad Abu Minyar al-Gaddafi (Lárúbáwá: مُعَمَّر القَذَّافِي‎ Muʿammar al-Qaḏḏāfī audio (ìrànwọ́·ìkéde);[variations] (7 June 1942[nb 1] – 20 October 2011), to saba je titokasi bi Colonel Gaddafi, ti je olori Libya lati eyin ifipagbajoba ologun to sele ni 1 September 1969 nigba to gbajoba lowoe Oba Idris ile Libya to si sedasile Orileolominira Arabu Libya. Leyin odun 42 lori ijoba o je ikan ninu awon olori topejulo lori aga. ↑ "The Prosecutor v. Muammar Mohammed Abu Minyar Gaddafi, Saif Al-Islam Gaddafi and Abdullah Al-Senussi". ICC-01/11-01/11. International Criminal Court. 4 July 2011. Archived from the original on 27 May 2012. Retrieved 3 September 2011. ↑ Salak, Kira. "National Geographic article about Libya". National Geographic Adventure. ↑ Charles Féraud, "Annales Tripolitaines", the Arabic version named "Al Hawliyat Al Libiya", translated to Arabic by Mohammed Abdel Karim El Wafi, Dar el Ferjani, Tripoli, Libya, vol. 3, p.797. Àtunṣe ojúewé yi gbẹ̀yìn wáyé ni ọjọ́ 2 Oṣù Kẹ̀wá 2013, ni ago 12:28.